By Luka Treiber, 0patch Team. As you've probably noticed, the last Patch Tuesday didn't make it. Consequently a number of 0-days are getting published, with CVE-2017-0038 being the first one on the list. But don't worry, every cloud has a silver lining. I had some free time last week to look into the matter and as a result I can give you the very first 0patch for a 0-day. CVE-2017-0038 is a bug in EMF image format parsing logic that does not adequately check image dimensions specified in the image file being parsed against the amount of pixels provided by that file. If image dimensions are large enough the parser is tricked into reading memory contents beyond the memory-mapped EMF file being parsed. An attacker could use this vulnerability to steal sensitive data that an application holds in memory or as an aid in other exploits when ASLR needs to be defeated. I have to kindly thank Mateusz Jurczyk of Google Project Zero for a terse and accurate report that allowed me to quickly grasp what the bug was about and jump on to 0patching it. The image had to be zoomed in to the max in order to see the intimidating heap data leaking through the colorful pixels. And it did leak consistently: reloading the PoC resulted in a different image on each reload. This is consistent with the report (one only needs to look closely enough). So the only pixel that originates from the actual data provided by the EMF file is that one (represented by the 4 bytes) - everything else is heap data read from out of bounds of the image pixel data. According to the report this is where all the trouble is. 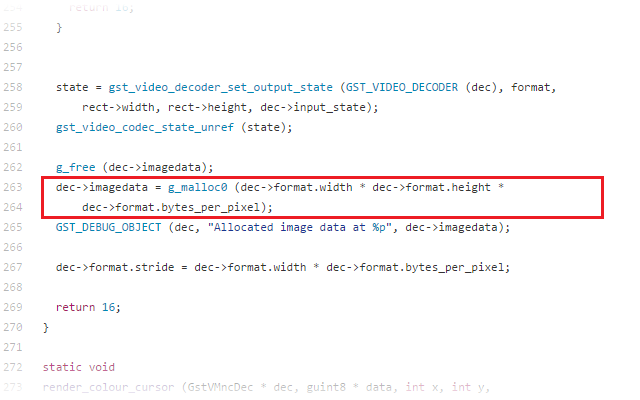 It says cbBitsSrc is not checked against "the expected number of bitmap bytes" - the number which is calculated from cxSrc and cySrc image dimensions. Width of the source rectangle, in logical units. Height of the source rectangle, in logical units. Size of source bitmap bits. After feeding WinDbg with symbols for EMRSETDIBITSTODEVICE type (explanation follows later) the explanation from the report finally got clear. 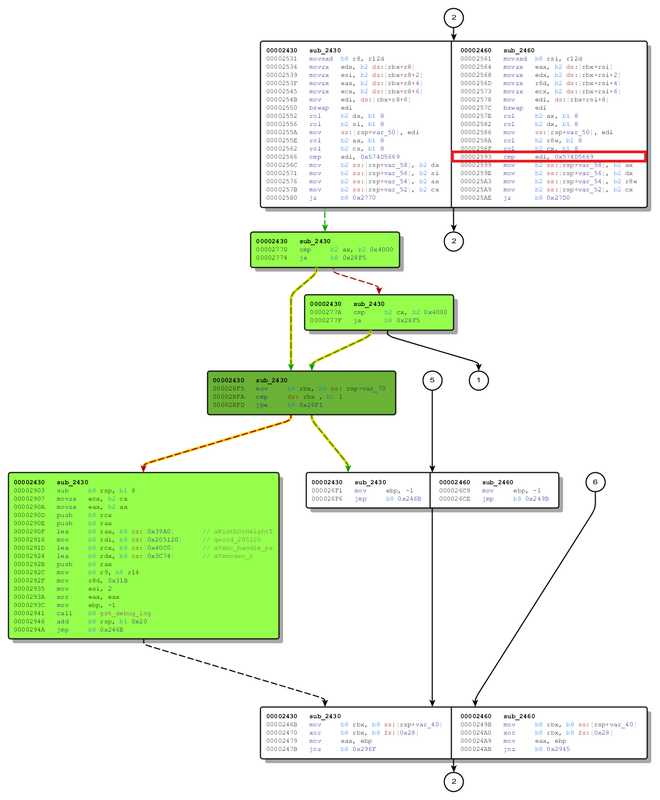 When processing the PoC EMF file, the EMRSETDIBITSTODEVICE structure (detailed in the lower right pane of the screenshot above) passed to the MRSETDIBITSTODEVICE::Play function as the first argument (rcx register that gets stored to rbx, marked in blue) contains cbBitsSrc set to 4, which does not match the 0x10 * 0x10 image dimensions defined by cxSrc and cySrc (these amount to 256 pixels or 1024 bytes). at the patch location there must be either a single instruction or several instructions that belong to the same execution flow (cross-references must not point anywhere in-between them). With this in mind I selected the exact patch location. In order to write as little patch code as possible I set the patch location at the first branch instruction that jumps to the function exit (avoiding the processing of image data) so I could piggy-back on it. On the code screenshot above, the patch location is marked in red while the repurposed jump instruction glows pink as a piggy. The result of pvClientObjGet call is checked against 0 at the patch location, followed by jne in order to jump to function exit (if rax is 0). The same jne that serves this logic can help our patch code exit the function: we only need to set rax to 0 if cbBitsSrc is smaller than cxSrc * cySrc * 4. It might seem desirable to select 000007fe`feeae3b8 as patch location at the first glance, but test rax,rax takes only 3 bytes so patching would also eat into the jne (which is not relocatable) because of the said 5-byte requirement. At the currently selected location, however, patching affects two 3-byte instructions - mov rsi,rax and test rax,rax - which are both relocatable. Having selected the patch location we can finally write the actual patch. Below is the content of a .0pp patch file ready to be compiled with 0patch Builder that is included in 0patch Agent for Developers - usage of which we already discussed in a previous post. At the beginning of the code_start section there is the cxSrc * cySrc * 4 calculation that gets stored in rcx. Both multiplications are followed by an overflow check so we don't end up with a product that seems within bounds but was produced by overlong factors. In case invalid image dimensions are detected, a call to a special function of our 0patch Agent is made in order to display an "Exploit Blocked" popup, and most importantly the rax register is set to 0 so that the following test rax,rax instruction can set the jump condition for the pink jne (resulting in the function exiting). ;NOTE: We checked that rcx is free to use. But since the type information is not available in WinDbg by just loading symbols from Microsoft's Symbol Server, the following workaround was needed. I compiled a bare-bone DLL project with only EMRSETDIBITSTODEVICE x; instance declaration as custom source. Then just before launching iexplore.exe I added the DLL to the AppInit_DLLs registry value so it got loaded into the process (thanks to this trick). 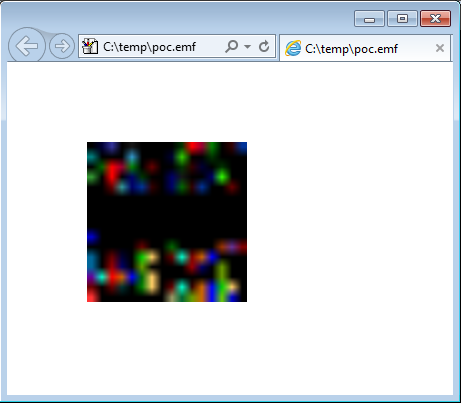 After compiling this .0pp file with 0patch Builder, the patch gets applied and instead of the rainbow image an empty image is displayed in the browser and an "Exploit Blocked" popup shows up. Here is a video I captured that summarizes the described process. So this is my first 0-day fixed. While not the most severe issue, I get shivers thinking that instead of the rainbow image, a malicious page could steal credentials to my online banking account or grab a photo of me after last night's party from my browser's memory. If you have 0patch Agent installed, patches ZP-258 through ZP-264 should already be present on your machine. If not, you can download a free copy of 0patch Agent to protect yourself from exploits against the presented issue while waiting for Microsoft's official fix. Note that when Microsoft’s update fixes this issue, it will replace the vulnerable gdi32.dll and our patch will automatically stop getting applied as it is strictly tied to the vulnerable version of the DLL. We have deployed this patch for the following platforms: Windows 10 64bit, Windows 8.1 64bit, Windows 7 64bit and Windows 7 32bit. If you would like to write patches like this yourself, do not hesitate to download our 0patch Agent for Developers and give it a try (we made the .0pp files available for download so you can build them yourself). We'll also happily accept any feedback. Now onward to writing the next 0-day 0patch. Things have been happening fast in the 0patch land lately: in the last few weeks we extended our OS coverage from Windows to Ubuntu and Fedora (still alpha, but major technical obstacles are out of the way), and created a micropatch that seemed to fix a remote execution vulnerability more thoroughly than vendor's original update. And now we're making probably the biggest step since the release of 0patch Agent: we're launching 0patch Builder (for Windows) - a tool that allows anyone to write a micropatch that can then be applied with 0patch Agent. That's right - security researchers can now write their own "alternative" micropatches to fix known issues in a micro-surgical, low risk manner while admins are testing huge official updates for potential functional problems. Or they can micropatch those 0days they have just found in a popular closed-source product. Software vendors can experiment with micropatching their own bugs to see how much easier and cheaper this approach can be compared to the status quo of petabytes of code being transferred over the Internet to effectively add a single bounds check on millions of computers (whose millions of users are then advised to take a coffee break as updates are being applied). Not to mention how easy and unnoticeable it can be to "un-apply" a micropatch: instead of installing and uninstalling massive updates, we're finally moving towards switching microscopic patches on and off. 0patch Builder is an essential component of the crowdpatching model we're building. Our vision entails thousands of security researchers, expert patch developers around the World writing micropatches for personal computers, servers, mobile phones, routers, smart TVs, fridges, online cameras, ATMs, light bulbs and smart meters. Many of them working for original vendors who will prefer to outsource patch development in order to keep their own resources on current projects, but some also writing patches for unsupported products and those whose vendors - let's put it this way - don't exactly assign high priority to security. We also envision patch bounties, a natural extension of today's bug bounties: why would vendors only pay researchers for finding bugs in their code, if the same researchers could also fix them? Sure, vendors will still decide whether to accept a patch or not but that will serve as feedback for patch developers to improve their skills and create better and better patches. In our wildest dreams, an entire 3rd-party patching industry emerges, supported by not only security research but also scientific research on proving correctness of code micro-changes, engineering efforts for bringing micropatching engines to all devices (hey, why not provided directly by CPUs? ), integrating micropatching support into development and reverse-engineering environments, automating patch generation from vulnerability-finding tools, and many other things we're not smart enough to imagine at this point. But enough of this visionary stuff - how do you go about writing your own micropatches? First you have to download and install 0patch Agent for Developers, which comprises a slightly modified 0patch Agent and 0patch Builder. Then you write a patch source file as described in 0patch Developer Manual and compile that file with 0patch Builder. Once you're done, your patch will immediately get applied to the module you're patching in already running processes as well as in newly launched ones. We also made it really easy for you to debug your patches by automatically setting breakpoints on their entry points. Now if you want to go ahead, read the 0patch Developer Manual for detailed instructions, some under-the-hood information and useful guidelines. Good luck, and welcome to the crowdpatching community! Let's fix some bugs, and then fix some more.